butternut squash grits… wow, they would be awesome with these scallops! These look divine….I am so glad you liked this book…rarely do my cookbook choices at CT find favor. Hi there, Mary! nice to “see” you! The book is great, I got it after your raving about it on CT… and this is my favorite recipe by far! I too have made these numerous times. Soooo good and so easy! Wow, I have to make this! what a great recipe..so easy but also elegant..i will definitely be making it..
Well will wonders never cease, this is the first mouth-watering recipe of yours posted that I have actually already made! And it is a great one, I made it over and over this winter after I first got the cookbook. I agree there’s not quite enough sauce in the original recipe. Never thought of making it with pork tenderloin but that’s a great idea. Your scallops look fantastic Sally and I have to smile reading about your blogging angst – I’ve got two similar dishes on ‘hold’ not entirely sure if I’m satisfied with the photos… a blogger’s life I think 🙂 You got a great looking sear on these and the orange, caramel sauce sounds pretty perfect. Delish! I’ve got a serious problem with brown food – brownies, chocolate cakes, ice creams, or beef stews. There must be a trick to making brown food look appetizing in photos, I just have no clue of what it is! Sally, it is Mary again…..what size pan did you use for the sauce…8 inch or 10 inch. BTW, do you have an ipad? I know you are a Donna Hay fan and her app just came out and her first magazine is free…. I have the 8-inch, smallest size. I see it’s backordered due to high demand… I am not surprised, it’s a cute and functional little skillet, priced right. Interesting, I ordered the pan yesterday from Amazon and got it today….the 8 inch, but when it came it looked smallish…. I am truly loving my ipad, I had neither previously….seriously consider one. Many sincere thanks again…..where was the original Donna Hay Fire Roasted Tomato Risotto recipe you made? They measure, I think – from the top opening of the pan, so the bottom is indeed small. Just checked and it is available from Amazon right now…. Thanks, for all…I ordered that book a few days ago….. I know how you feel about photos! I’ve made some dishes I’d like to post, but the photo was horrible!! 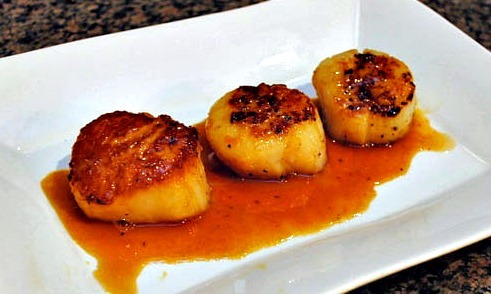 And, I know about not wanting to ruin scallops with a not so good recipe! I’m excited to try this out. I love the sear on it from the carmelized sweetness. Sally I read that now that they’ve introduced the new iPhone, you can get the iPhone 3Gs for free if you enter a contract with one of the carriers. Those look and sound awesome, Sally.